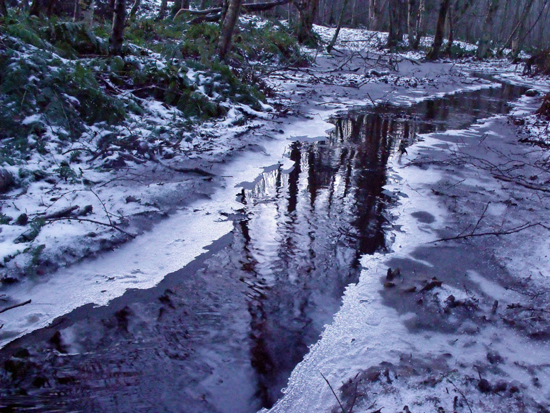 A frozen stream in the woods a couple of Solstices ago. Bleak or beautiful? Christmas. Yule. A time of celebration, feasting, lights, sparkle and joy, rest and relaxation and all your favourite people, food and activities. Is it? Is that what it really is for you? His Christmas would begin at midnight when the elderly and infirm (who should not be out of their warm beds in the middle of the night, midwinter, Northern Scotland) started collapsing in church before, during and after Mass. The daytime was mainly filled with people who have conditions that negate the eating of rich foods and drinking of alcohol who were then suffering the various consequences of having done so. But the evening was the worst. All day long family members who rarely see each other and like each other not at all had been suppressing their bitterness, gritting their teeth at Great Aunt Mildred's jibes and generally seething. By about 6pm things were breaking down. Literally. He was expecting nervous breakdowns, domestic violence, suicide, murder attempts and sobbing. Lots of sobbing. 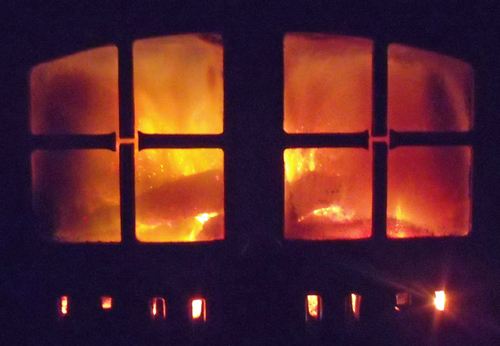 Authentic picture of the fire last Christmas Day 🙂 Snuggling up in front of it is so good, as are: normal quantities of good food; closeness with the people you cherish most; crap on telly and festively shaped chocolate. The beauty of midwinter is much easier to see in these conditions. 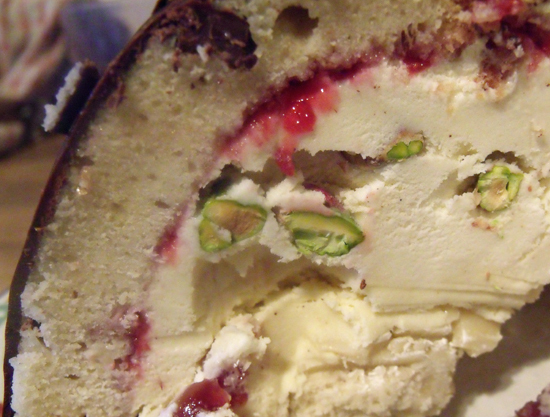 Ice Cream Bombe that was consumed on a perfect, peaceful Christmas. Recipe here (is very easy and can be made much in advance), extra preparation pics here. The fact that putting your foot down over your Christmas may extend out into the rest of your life leading to much self authentication, joy and freedom? Again: all you. We too have been paring down christmas over the years and no longer do what others expect us to do. It makes for a much more relaxing festive season. Sure, sometimes emotional blackmail is tried but we dont feel bad at all about saying no. We’re still working out what this time of the year really means to us and how we really want to celebrate it but we do know its all more enjoyable spent with people we choose to spend it with rather than those we feel obliged to. That ice cream bombe is very tempting. My mum gets very stressed at Christmas. I always feel bad for her – but not bad enough to help. Best to stay out of her way. But, I’ll tell her you are happy to help out this year, she need only ask!